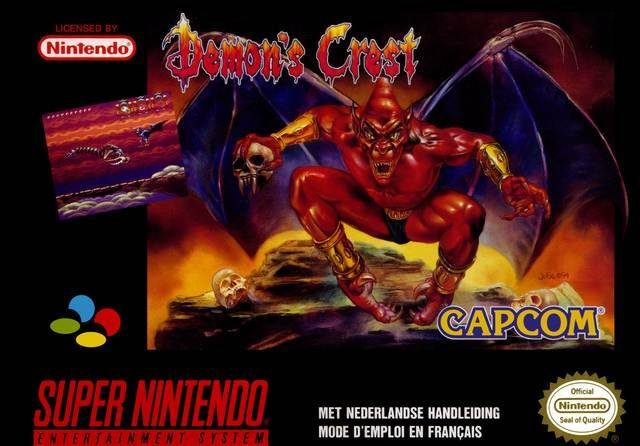 Demon's Crest for Super Nintendo embarks you in a struggle for control of the six magical stones. The stones combined together comprise the Demon's Crest, which grants ultimate power to its possessor. You play as Firebrand, a gargoyle that emerged from a bloody civil war as the holder of the Crest. Unfortunately, your nemesis, Phalanx has stolen the stones and scattered them throughout the realm. Retrieve all six of them though seven levels. Each stone allows you to morph into a different gargoyle form, each with unique abilities and attack modes.